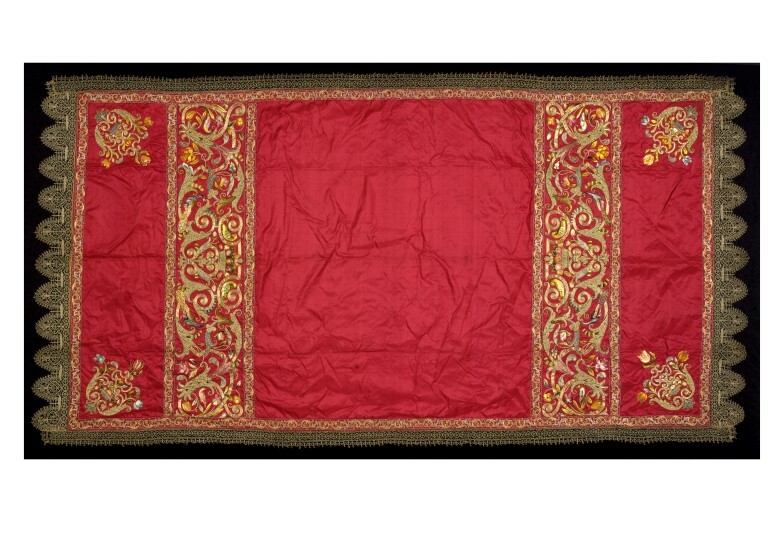 This blanket belonged to the Muti Papazzurri family (formerly Savorelli), who used it at the christening of their first-born sons. At christening and other ceremonial occasions, families wrapped their swaddled babies in christening blankets or bearing cloths. They were of rich materials, typically silk velvet, or silk woven or embroidered with a pattern in gold or silver thread. They often had elaborate borders. 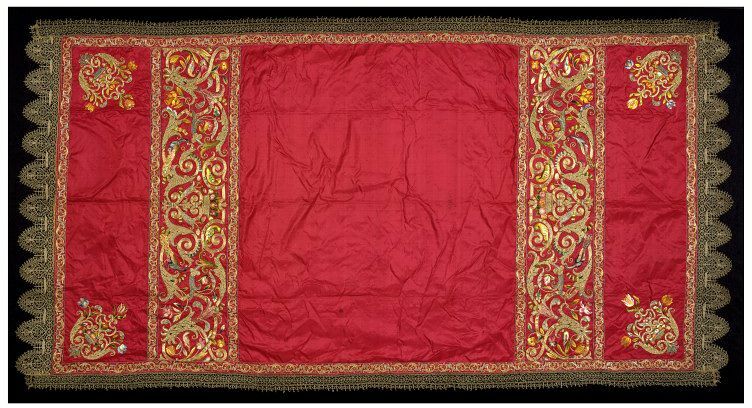 Such blankets displayed the wealth and status of their owners, and would be used only on special occasions, treated with great care, and passed down through the generations. 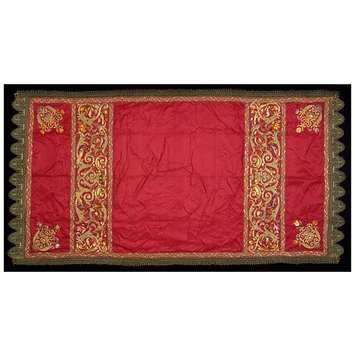 Christening blanket of red silk lined with lightweight yellow silk and embroidered with floss silks, silver-gilt and silver thread in long and short, split and upright gobelin stitches, and with laid and couched work including basket work and raised work. Trimmed all round with silver-gilt bobbin lace, the narrow ends having deep scallops in the Genoese style. The blanket has a narrow 3cm border all round filled with a repeating pattern of paired leafy scrolls linked by angular S shapes. The two ends are decorated for a depth of 54 cm with symmetrical motifs (placed diagonally in each corner) of strapwork and leafy scrolls decorated with tulips and enclosing a basket of flowers, and above them a broad band across the full width of the cover. This is filled with a symmetrical but vigorous and free-flowing design of strapwork and leafy scrollwork decorated with pansies, daffodils and other fruit and flowers, with peacocks, parrots and other birds and, in the centre, with a basket of fruit. The blanket belonged to the family of the Marchesi Muti Papazzurri gia Savorelli, whose principal house was the Palazzo Muti (later Savorelli an now Palazzo Balestra) in Piazza SS Apostoli in Rome. It was used at the christening of the first-born sons. There was a second blue blanket for younger sons, and, the donor believes, a third for daughters. The donor's mother was the last direct descendant of the Savorellis.